I’m waiting for the moment when I can be allowed to begin again. I think I’ll feel it like an unexpected wind that will shock me as it bristles through my jacket and light cotton shirt. It will be like a car shifting into reverse. Or winning a game in the last few seconds. I’m waiting for that moment. I wonder if it will come. Do I just wait here? Or do I force it to happen? I’m thinking about that time that one Christmas. That time when something beautiful happened and I felt different about traffic and that bell that the Salvation Army people ring outside of grocery stores. It went from a loud annoying ring to something amazing and suddenly I discovered the point of charity and what giving back really meant. Despite the fact that I’m surrounded by people right this second, I don’t feel surrounded. I feel…alone. Alone in my thoughts and my feelings. I just read all of the birthday cards that everyone gave me. It took awhile. There were a lot. I’m trying to believe all of the things that they wrote. They are true even if they don’t feel true. After all, why would people take the time to write the same thing over and over again if it wasn’t true? People don’t have that kind of time. I’m waiting here to breathe again. Christmas carols wash over me in a familiar way. They stay constant although I change. Elvis sings about a blue Christmas. I keep waking up with vivid dreams. Last night a glass exploded in my hand and the small shards were stuck in it. I couldn’t move my hand because everyone around was afraid to touch it in case the glass would embed further into my hand. I was on a hunt to find someone to take out the glass. I would try to climb the narrow, trecherous stairs in the lobby of a high school so that I could discover someone to fix my problem. What does this mean? What does it mean that I got seriously angry at Kurt on Glee because he’s decided to leave his friends and his school? I didn’t like that Kurt gave up. To me, he didn’t try hard enough. But then again, I don’t know what it’s like to be bullied at my school. I have never been THAT much of an outcast. Kurt could be me but he has an out. He can leave his pain and because it’s TV, things will probably get better for him in an episode and a half. Life should be as short as TV. How Do I Love My Neighbors If I Don’t Even Know Their Names? Note: I’m writing this after reading Kristin’s blog about how we’ll go far away to serve people we don’t even know but the people who live among us, we really have no clue about. I have to admit something that I’m not proud of. I don’t know my neighbors. Considering I’m a follower of Jesus and Jesus said to love your neighbors, I find it embarrassing that I only know of Susan down the hall from that one time I was trapped in the laundry room with her when she was blocking the exit. I live in a condo (apartment for me) and I don’t know very much about any of those who live amongst me. I find it sad. Sometimes I try to wave at people when I’m leaving. But is that really enough? I’m not trying to be hard on myself, just trying to figure out how I can spend months trying to go to the Czech Republic where I met amazing students and yet, I have no clue who lives next door to me. My mom went to the movies with one of her elderly neighbors the other day because that lady was lonely and having a hard time. I see people near the mailboxes sometimes but most of the time they are on the phone or I’m about to go back to my very important task of Facebook stalking so I’m too busy to concern myself with them. This Thanksgiving I’m asking the question, “How do I love what’s right in front of me?” It’s so easy for me to get all excited about the possibility of loving people across the world. I talk to a few friends in the Czech Republic frequently. And, I have to admit I was totally jealous when my cousin who is a pediatrician, told me that she was going to Kenya in a few weeks on a medical mission! Oh how amazing that would be! Of course it would in my idealized mind. I’m sure it’s going to be hard. But when you go to Africa to serve others, it’s definitely seen as selfless. I’m guessing the harder work, and the work that I’m now being called to, is checking on my neighbors and actually forming relationships. It’s investing in my co-workers. It’s not being too tired to listen to a friend who really just needs my ear and not my well-worded answer about how she should do this or that. I don’t have any easy answers. I’m just wondering, how do I tangibly love my neighbors more? What does that realistically look like? Is it a knock on the door? Is it more than a wave? Maybe I could just bake some cookies? Could being a neighbor really be that simple? I think it might take time to become a good neighbor. 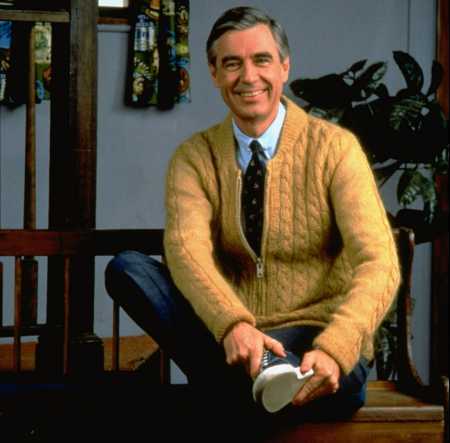 Maybe I should ask Mr. Rogers. Or you. What do you think it means to be a good neighbor? How do you love your neighbors? Lonely strife taking its toll. Toward peace I slowly creep. When nothing makes much sense. Until I wrested with you. And somehow, I keep moving. Random meeting #1 – The Starbucks inside of the Jensens Grocery Store in Lake Arrowhead, CA last weekend. Two small, dark haired kids maybe 8 and 9 sit at a round table eating their lunch. Their mom sits nearby. Clearly this family is just hanging out at Starbucks on an afternoon, hoping something interesting will happen. My roommate Jill, myself, my friend Jonathan, and my friend Lucas all sit sipping our chai lattes and hot chocolates together. It’s been a very intense weekend up until this point. I’ve cried a lot, I laughed some, and frankly I was sick of experiencing so many heavy emotions. As soon as I saw Jonathan, I recruited him to come to coffee with us. After seeing Lucas, we grabbed him, too. Sitting there in the faux Starbucks in the middle of the grocery store, all of the energy was zapped out of me. I couldn’t talk about consecrating my coffee much less my spirit at that point. So I did the only thing I knew how to do. I told a joke. IT was a lame joke about a kid taking a bath. I admit it now. But that joke paved the way for us to start laughing together and joking. Soon, the kids next to us joined in and we made an unlikely connection. Suddenly the kids were telling us riddles and we were having a joke war. Who could tell the most clever riddle? Who could answer the most randomly? (I think I won that contest). It seems rather silly now. But at the time it was proof to me that God cares about the little things. Making that little girl and boy smile just because they could and because we were all there in that moment seemed really important. My problems didn’t vanish but for a few minutes they were put on hold and I was able to feel that connection that strangers feel when they aren’t strangers for a few moments. It was fantastic. Random meeting #2 – La Canada Post Office. Eccentric guy in running shorts with a box. He’s waiting in line to talk to the postal worker about whether this box would work for him. I’m standing there, minding my own business, when this guy starts making a big deal about how the plain looking boxes are free and the pretty ones cost money. I ignore him at first but then he is behind me in line and I don’t want to be rude. “Where were you born?” he asks. I hesitate. It makes me sad in retrospect that someone striking up a conversation at the post office seemed weird. That’s where conversations SHOULD happen. So I answered and told him, “Colorado.” He wanted to know what part, so I continued to engage him. And then he asked the question. “Hmmm…a beach.” I said, rather non-chalantly. “Probably one in Mexico,” I said, thinking back to this beach in Cabo that I really enjoyed. “Mexico? Have you ever been to Hawaii?” he asked. “Nope, I’ve always wanted to go there.” I answered. “You need to go to Kauai. That’s where the most beautiful beach in the world is,” he remarked. I knew Hawaii was supposed to be really nice, but nicer than Tahiti? I was thinking about beaches after my weekend retreat. On the retreat I had visions of a beach that were so beautiful that they took my breath away. They were only in my imagination, but the visions brought such peace to me that I knew I wanted to go to that place some day and experience it for real. “Okay, I’ll go there.” I determined. And so I decided. I’m going to this beach. Hawaii couldn’t be THAT expensive to save up for. I googled the beach today. I don’t want to tell anyone the exact beach he told me because I’d rather save that for myself. But I will get there someday. Hopefully soon! As soon as I decided this, the eccentric guy disappered. He was done with the post office and went outside, walking away from me down the street. Sometimes I wonder if we humans just bump into each other for moments of revelation. This seemed like one of those to me. It’s so easy for me to walk around in my own bubble, in my own space, hoping for someone to notice. But Post Office guy made me think, “I need to be more bold. I need to strike up a conversation with someone random.” Aren’t we all hoping deep down someone will notice us? I was noticed. It felt good. And now something tells me I should go to that beach. Have you ever had one of those moments when you tried really hard at something and then it didn’t work out? I’m sure you have. Life is full of moments like this. Disappointments. I’ve had my fair share of these but what about when the opposite happens? What about when you try your best at something and totally think it’s never going to work and then it does? One of those experiences in my life came back to me this week in my musings on the way to work. I heard this ad on the radio for “A Chorus Line” and it made me smile. I thought back to 8th grade. 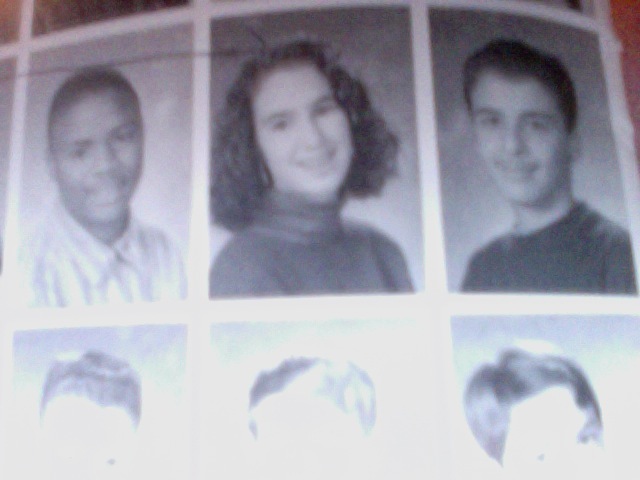 Imagine me, a 14 year old with a perm and braces, who had a dream. All I had wanted to do since I was ten years old was to move to California and act. 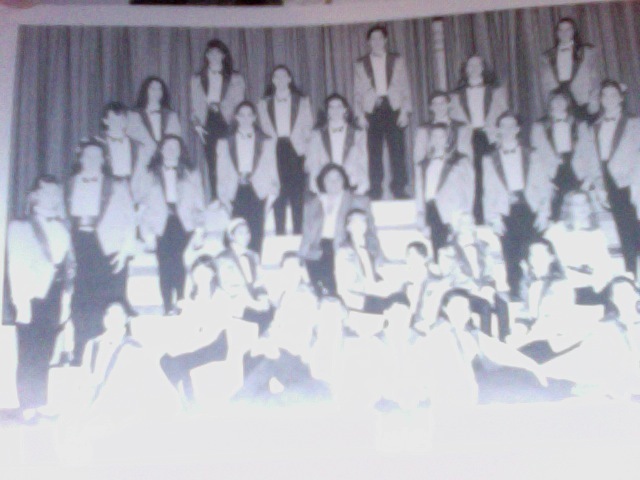 I knew that as a part of that, I would need to sing and so I tried out for my middle school’s show choir, Medinah Motion and Company. Imagine my surprise when I made it in! I still remember my Motion days well. For competitions we wore black pants and black shoes along with our royal blue suit jackets with sequins and matching blue sequined cumberbunds and blue bowties. This was way before the Glee days. I wish in retrospect I would have written this down. I’d be famous like Ryan Murphy now. We would sing the latest hits like Mariah Carey’s “Hero,” or “A Whole New World” and we’d even learn all of the singing parts and dance moves to go along with our vocals. Anyway, I remember that as part of Motion, we were asked to sing in the Illinois Grade School Music Association’s Solo Ensamble contest. Now I could sing, especially when I had guidance, but I was never a soloist. I was part of four ensambles. That much I knew. Still, Mrs. Holland, our music teacher, asked me what number I wanted to do on my own. I immediately thought, “This is it! My shot!” I figured if I could get a 1 (the best score) on my solo some talent agent from Hollywood would be sitting in the audience (of this random elementary school in the suburbs of northwest Chicago?) and he would discover me! I had it all planned out. I needed a piece with “acting” in it. Now I’m not exactly sure what Mrs. Holland was thinking when she thought I would make a good Morales from “A Chorus Line.” I was neither street smart, Latina, nor did I ever swear or have much of an amazing singing range. I was pretty much a goody two shoes with stars in her eyes. This much I had in common with Morales: she was a woman trying to get a break in show biz. And she tried taking all of these acting classes but just didn’t get the point of it. That’s what the song, “Nothing” is basically about. You can listen to it here and see what I’m talking about. Being the idealistic teenager I was, when Mrs. Holland gave me the number and I started meeting with my accompanist, I thought it would all come together rather naturally. But it didn’t. For weeks I struggled with the song. I tried to learn the part. I tried to act out the parts when Morales was more talking than singing. I tried to put my heart and soul into it. A week before, I would practice and cry. I never made it all the way through the song without totally stopping and starting all over again. My parents watched me. From their bleak looking faces I knew this was a total mistake. They got mad at Mrs. Holland for assigning such a hard solo to a novice such as myself. They told me to go back and get a new song. I thought about it but in those days I was really afraid of what people thought of me and I decided I had to keep the song. But it was agony. The night before the contest, I knew my ensamble pieces cold. We were singing a 50s doo-wop piece, some Andrew Lloyd Webber song, and a couple of others that I don’t remember. And then there was “Nothing.” I dreaded it. The tape I had to sing along with that had my part on it was practically falling apart. I’d practiced and practiced. It was still horrible. I went to bed scared that I wouldn’t be able to show my face around school after the contest. I had nightmares about blowing the whole contest and running out of the room crying and having the judges give me a 4 out of pity. The next morning at the competition, I got through the ensambles okay. It was a long day. The time for my solo came. My friend Jamie came to watch. I remember because she was one of the best singers I’d ever heard as well as part of Motion with me. Her parents were in the audience, too. I was nervous. I remember that my hands were sweaty. As soon as the piano started, something inside of me changed. I knew I had to get through this but that I didn’t want to actually get through it, I wanted to do it the way I had always wanted to do it. Although I had never done the whole song the whole way through yet, somehow I had to make it work. I prayed. I begged God to help me. In those few moments, I became Morales. I don’t know how I did it. Maybe I suddenly felt her frustration from trying to be her for so many weeks. I found myself acting. I found myself showing my audience all of my emotions, which was ironic since the song was about a woman who had a hard time conjuring up her emotions when she most needed them. So there it was. I was finished with the song. The longest 5 minutes and 40 seconds of my life. But I had owned it! In the end, people clapped. I remember that part. And I knew I had given it my best. At the awards ceremony, I received a 1. 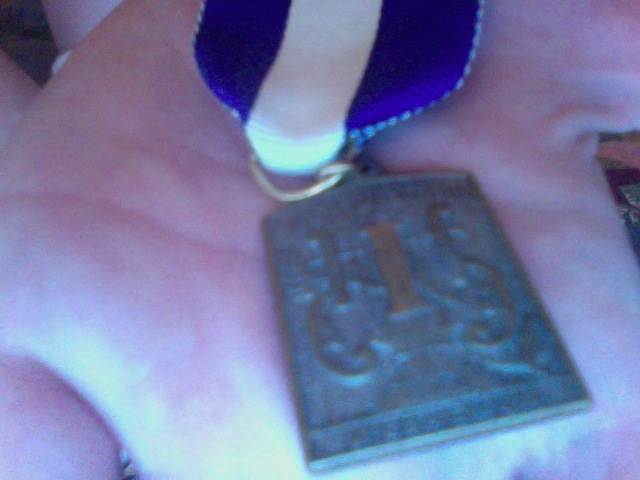 I still have the little medal that they gave me. I couldn’t belive it. I still to this day consider it a miracle. There is no way I should have been able to nail that song. It was impossible. But somehow, I did. It gives me hope for those times when I’m faced with disappointments. When things seem totally impossible and I have to get through it no matter what. It makes me think that I’m stronger than I might realize. I have hope in those moments that there will be many more Morales’s in my future. Waiting for Someone to draw in the notes. That I didn’t know then. My hair is soft and short and I’m wearing a red dress that I’ve since forgotten. The girl in the picture had not known heartbreak or show business very well. Never realizing she was about to be stretched. 7 living situations later, countless jobs and bosses gone. Social justice discovered. Prayers prayed. She is not the same. She’s wised up. She waits and somewhere in that fog, she hopes. Trusting that 31 will not be 30 or even 23. That will one day look back and smile knowingly. And there is beauty there in that discovery. A song I’ve been listening to.